Hundreds of Tunisians protested on Tuesday against a visit by Saudi Arabia's Crown Prince Mohammad bin Salman, denouncing the kingdom's de facto ruler as a murderer in a second straight day of demonstrations condemning the killing of Saudi journalist Jamal Khashoggi. 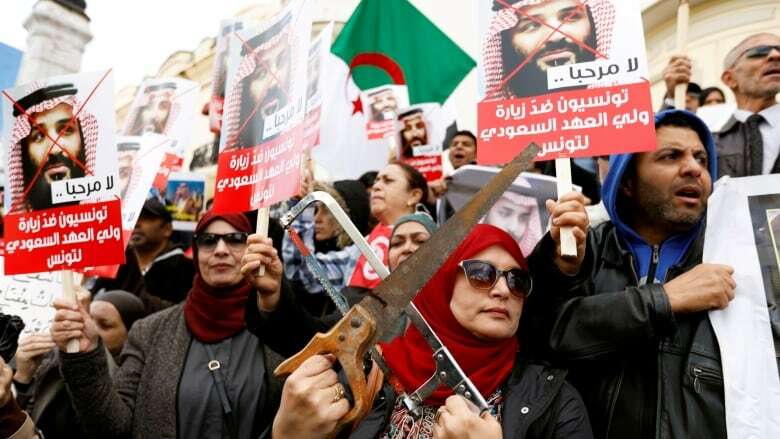 The protests were a rare occurrence for the crown prince, the kingdom's de facto ruler, who faces no overt criticism at home and who received a lavish reception earlier in his tour in visits to Bahrain, the United Arab Emirates and Egypt. Hundreds of protesters marched through the central Habib Bourguiba avenue in Tunis, scene of the mass protests that toppled the country's Zine El Abidine Ben Ali in 2011, on the second day of demonstrations against the Saudi prince. They chanted "the murderer is not welcome in Tunisia" and "Shame on Tunisia's rulers" for receiving bin Salman. The killing of Khashoggi, a Washington Post columnist and a critic of the crown prince, at Riyadh's consulate in Istanbul six weeks ago has strained Saudi Arabia's ties with the West and battered Prince Mohammed's image abroad. The crown prince has found a backer in President Donald Trump, who has called the Khashoggi murder abhorrent but stressed bin Salman's denials of complicity as well as the interdependent economic relationship between the U.S. and Saudi Arabia. The prince was welcomed by Tunisian President Beji Caid Essebsi when he arrived at the airport in Tunis from Cairo, the presidency said, and he left immediately for talks with Essebsi at Carthage Palace, the presidential seat. Protesters raised a large poster which depicted the Tunisian president pouring water on the bloodied hands of the Saudi crown prince — suggesting Tunisia's complicity in washing away guilt. Protesters also called for an end to the Saudi-led military campaign in neighbouring Yemen, which was launched by Prince Mohammed in his role as defence minister in 2015. 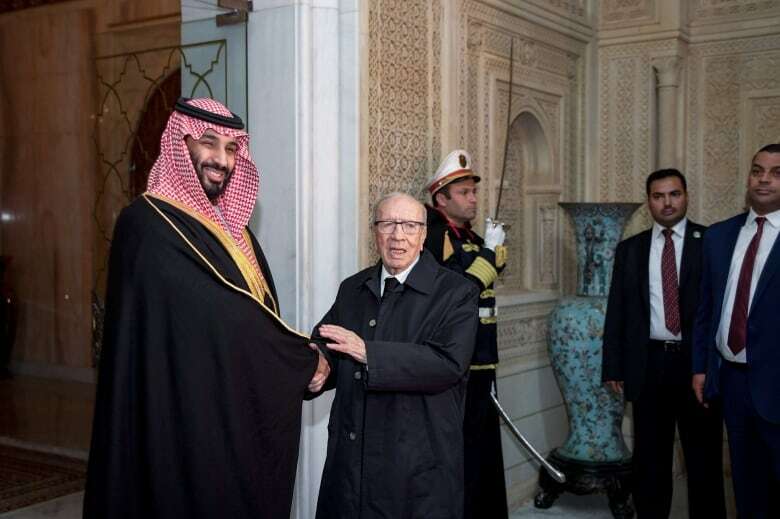 Last week, Nourredine Ben Ticha, adviser to Essebsi, said the truth about the killing of the Saudi journalist needed to be established but the incident should not be used to harm the kingdom's stability. Tunisia and Saudi Arabia are very different political systems. The kingdom is an absolute monarchy while Tunisia has undergone a democratic transition since 2011. The north African country has been holding free elections since then and agreed in 2014 on a constitution guaranteeing fundamental rights such as freedom of speech. Tunisia was a strong Saudi ally under Ben Ali but ties have since been strained at times. The kingdom granted exile to Ben Ali, who flew to Jeddah on the Red Sea after his ousting, resisting calls by some Tunisian parties to hand him over. In contrast, Tunisia has since 2011 expanded co-operation with Qatar, with which Saudi Arabia and three other Arab states severed trade and transport ties in June 2017. The four accused Doha of supporting terrorism and Iran, charges Doha denies. The prince is expected to fly on to a G20 summit in Argentina later this week.